Adopting two puppies from the same litter or two dogs who are bonded together can be a great experience but it can also be a challenge. Two puppies will always mean twice the cost. Keep in mind that the average dog requires between $580 and $875 in care each year, depending on his size, according to the American Society for the Prevention of Cruelty to Animals. Multiply that figure by two and you have between up to $1,750 in annual costs. That’s not including the initial expenses you’ll face in the first year of ownership, which run between $784 and $968 per dog, according to the ASPCA Checkups and vaccinations are necessary but that means digging deeper in your pocket. Food will also cost you more. Bonded dogs who are used to being around each other can become distressed when one is away. You may be able to control this situation if you give each dog a little time away from each other every day. Maybe let one of them outside or take one for a walk at a time. Enough of the cons, adopting any animal is a wonderful thing to do and adopting two is even better. You’re giving two canine friends a chance at life and love instead of one. Crate training two puppies will be easier since both will keep each other company. The same is true when they’re left home alone. 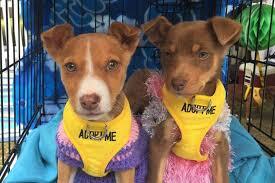 Most will recommend not adopting two puppies at once because the cons out weight the pros. If you do decide to adopt two, adopt one at a time. Allow the first pup to adjust to his new surroundings before introducing the second one. This entry was posted on Tuesday, April 2nd, 2019 at 9:17 am	and is filed under Pet Supplies. You can follow any responses to this entry through the RSS 2.0 feed. Both comments and pings are currently closed.